I first learnt about Subcutaneous testing from Matt Davies and Rob Moore's excellent Microtesting - How We Set Fire To The Testing Pyramid While Ensuring Confidence talk at NDC Sydney. The talk introduces its viewers to various testing techniques and libraries you can use to ensure speed and confidence in your testing strategy whilst avoiding the crippling test brittleness that often ensues. The term subcutaneous means "situated or applied under the skin", which translated to an application would mean just under the UI layer. Why would you want to test under the UI later? As Martin Fowler highlights in his post on Subcutaneous testing, such a means of testing is especially useful when trying to perform functional tests where you want to exercise end-to-end behaviour whilst avoiding some of the difficulties associated with testing via the UI itself. Subcutaneous testing can avoid difficulties with hard-to-test presentation technologies and usually is much faster than testing through the UI. The big danger is that, unless you are a firm follower of keeping all useful logic out of your UI, subcutaneous testing will leave important behaviour out of its test. In previous non-core versions of ASP.NET MVC I used to use a tool called FluentMvcTesting, however with the advent of .NET Core I was keen to see what options were available to create subcutaneous tests whilst leaning on some of the primitives that exist in bootstrapping one's application. This investigation ultimately lead me to the solution we'll discuss shortly via the new .AddControllersAsServices() extension method that can be called via the IMvcBuilder interface. Looking at the source code it appears that the AddControllersAsServices() method populates the ControllerFeature.Controllers collection with a list of controllers via the ControllerFeatureProvider (which is indirectly invoked via the PopulateFeature call). The ControllerFeatureProvider then loops through all the "parts" (classes within your solution) looking for classes that are controllers. It does this, among a few other things such as checking to see if the type is public, by looking for anything ending in with the strong "Controller". Once the controllers in your application are added to the collection within the ControllerFeature.Controllers collection, they're then registered as transient services within .NET Core's IOC container (IServiceCollection). What does this mean for us and Subcutaneous testing? Ultimately this means we can resolve our chosen controller from the IOC container and in doing so it will resolve any dependencies also registered in the controller, such as services, repositories etc. Now all that's left to do is create a derived version of Startup.cs which we'll call TestStartup then call AddControllersAsServices() after setting up MVC. At this point we've managed to successfully exercise end-to-end behaviour in our application whilst avoiding the difficulties often associated with with hard-to-test UI technologies. At the same time we've successfully avoided mocking out dependencies so our tests won't start breaking when we modify the implementation details. Request filters No HTTP request also means any global filters you may have will not be invoked. 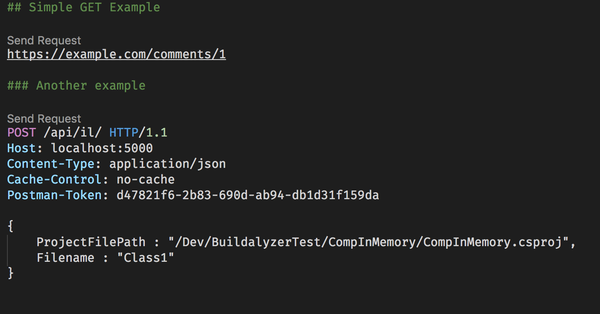 As we're not generating an HTTP request, you'll notice ModelState validation is not set and would require mocking. To some this may or may not be a problem. Personally as someone that's a fan of MediatR or Magneto coupled with FluentValidation, my validation gets pushed down into my domain layer. Doing this also means I don't have to lean on validating my input models using yucky attributes. Hopefully this post has given you a brief insight as to what Subcutaneous Testing is, the trade offs one has to make and an approach you could potentially use to test your applications in a similar a manner. There are a few approaches out there, but on occasion there are times where I wish to test a behaviour inside of my controller so this can do the trick. Ultimately Subcutaneous Testing will enable you to test large parts of your application but will still leave you lacking the confidence you'd require in order to push code into production, this is where you could fill in the gaps with tests that exercise the UI. The phrase "the right tool for the job" is one we've all heard in software development and we've all most likely said it at some point. However when you stop and think about what such a phrase actually means you begin to realise it's actually quite a problematic one, it makes too many assumptions. One could also go as far to say it has the potential to be quite a detrimental way to justify the use of a tool over other alternatives. This post aims to take a look at what those five seemingly innocent words really mean, and hopefully by the end of this post you'll possibly reconsider using it in future, or at the very least be a little more conscious about its use. Often when you hear the aforementioned phrase used it's usually in the context of making an assertion or justification for the most suitable framework, language or service to be used in a given project. The problem with this is it makes too many assumptions. It's rare anyone truly knows the full scope and nature of a project upfront until it's done. You may have read the ten page project specification, or know the domain well, but ask yourself this - how many times have you been working on a project only to have the scope or specification changed underneath you. No one can predict the future, so why use a language that implies unquestionable certainty. Ultimately building software is about making the right trade offs given the various different constraints and conditions (risks, costs, time to name a few), there are no "right" or "wrong" solutions, just ones that make the appropriate trade offs, this also applies to our tooling. "The right tool for the job!" said someone whose assumptions, past experience, motivations, and definition of "job" aren't explicit. Have you ever needed to skip a test under a certain condition? Say, the presence or absence of an environmental variable, or some conditional runtime check? No, me neither - that was up until recently. Skipping tests is usually a good practice to get into, but I use the word "usually" here because as with all things in software there sometimes certain constraints or parameters that may well justify doing so. In my case I needed to skip a certain test if I was running on AppVeyor in Linux. Depending on your scenario it might be possible to simple use an #if preprocessor directive to include the test. If you're wishing to exclude a test based on the operating system the test were running on then this may be a solution. My scenario also involved checking the presence of environmental variables, which I'd rather do through code. This led me to the next approach which I felt was more suitable. 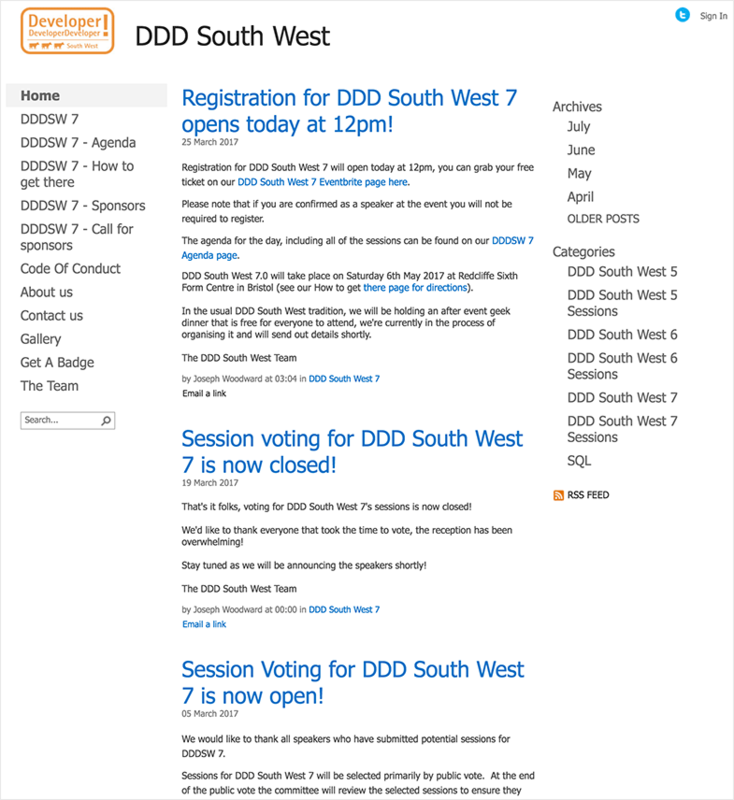 Since getting involved with organising the DDD South West event last year, one thing that was unanimous around the team of organisers was how we needed a new website. 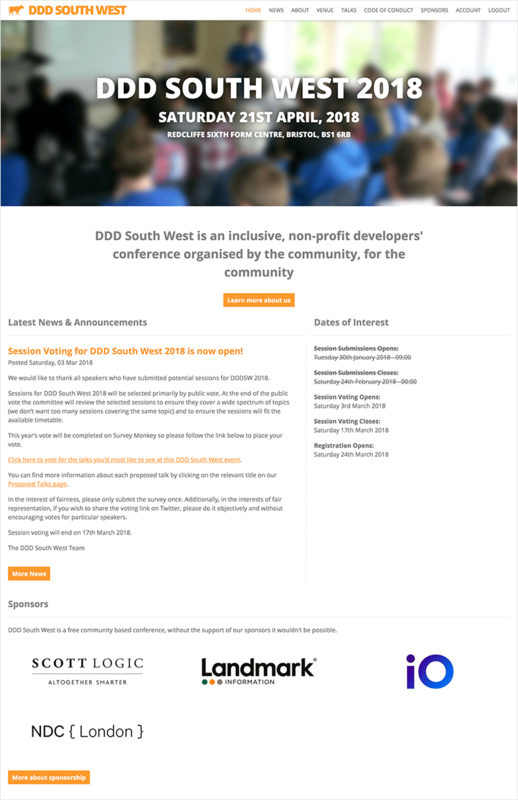 The previous website was a free SharePoint hosted solution that had a number of problems (slow, design could be improved, lots of manual processes, speaker submissions by sending word documents etc), so after last year's conference I started working on the new DDD South West website, and with the 2018 conference approaching it was a bit of a panic to get it finished in time. Luckily it was all sorted by the time we opened for speaker submissions (with a bit of JIT development). Surprisingly considering there are very few tests everything has worked without any problems, and what's more is it's all open source! Here's a screenshot of the before and after, hopefully you'll agree it's a large improvement! Migrating my blog from .NET Core 1.x to 2.x. I've been meaning to do this for a while now, and migrating a blog to a major version number when you know there's lots of breaking changes isn't something you charge at with gusto. Suffice to say it was painful and I ran into some weird issue where I quickly realised it was easier to just create a new project and start copying things over than to figure out what was going wrong. I managed to get the website back up and running but still had a lot to fix on the login/admin side of things which uses OAuth and Google sign-in. So whilst the website was functional the admin area (and thus my ability to post) was not. Couple with the finishing the DDD South West website it all took a bit of time. Anyway, it's all working now so that's a relief and I've got a few posts lined up. 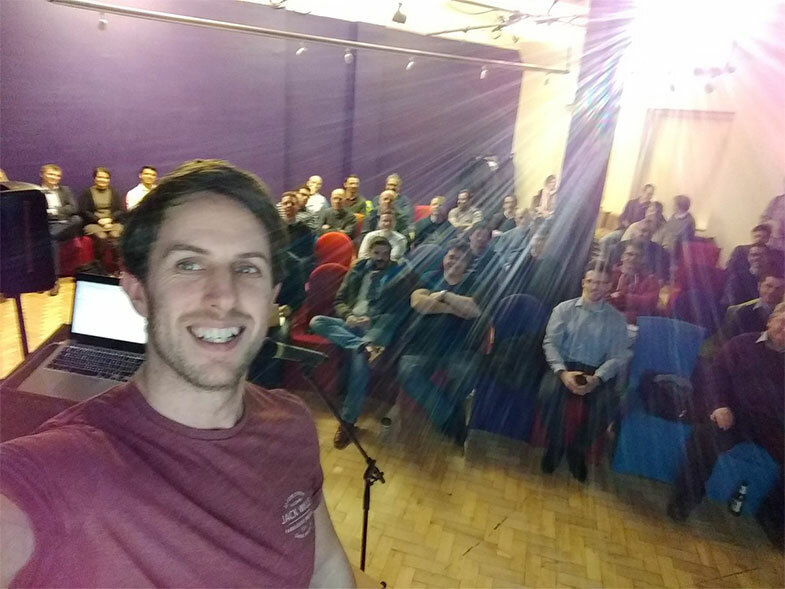 A couple of weeks ago I had the pleasure of being invited to the .NET Oxford user group to talk about all of the new features in Razor for ASP.NET Core 2.0. It's a talk I've given a few times before but this time around I was keen to update it with a bit more focus on the newer features in 2.0, such as the ITagHelperComponent interface and Razor Pages. As a .NET meet up organiser myself, I always enjoy the opportunity to visit other .NET focused meet ups as it's always interesting to see how they operate, and to meet other .NET developers in the wider UK community. It's also a great chance to borrow ideas to potentially incorporate into .NET South West. Overall I was really happy with the way the talk went (though I do wonder if I harped on about how great Rider is a little too much) with a good number of questions throughout and afterwards. Each talk I give I always try and focus on one habit I've noticed I've picked up, or wish to improve on when presenting, whether it be talking slower, less or more energy etc. On this occasion it was spend less time looking at the screen behind me and more time focused on, and looking at the audience. Whilst the session wasn't recorded I was quite conscious of it throughout and feel I did much better than previous sessions. All in all it's been a crazy couple of months and now everything is settling down I'm looking forward to getting back into regularly blogging. Oh, and on one last note - I've been selected to speak at DDD Wales (their first one!) which I'm really looking forward to. For anyone that regularly reads this blog will remember that recently I developed a convention based ASP.NET Core exception handling library named GlobalExceptionHandler.NET (if you missed the post you can read about it here). GlobalExceptionHandler.NET hands off ASP.NET Core's .UseExceptionHandler() endpoint and enables developers to configure HTTP responses (including the status codes) per exception type. Will result in the following output if a RecordNotFoundException is thrown. "Message": "Record not be found"
Whilst the initial version of GlobalExceptionHandler.NET was a good start, there were a few features and internal details that I was keen to flesh out and improve, so Version 2 was a pretty big overhaul. Let's take a look at what's changed in version 2. The first version of GlobalExceptionHandler.NET had its own implementation of UseExceptionHandler which would catch any exceptions thrown further down the ASP.NET Core middleware stack, there was no real motivation for creating a separate implementation other than I didn't realise how extensible the UseExceptionHandler API was. As soon as I realised I could offload some of work to ASP.NET Core I was keen to do so. Now I was using the UseExceptionHandler() endpoint, I was keen to have a more meaningful fluent approach to integrating with ASP.NET Core, so I ultimately went with a WithConventions() approach as the name felt a lot more natural. One problem the previous version of GlobalExceptionHandler.NET had was it couldn't distinguish between exceptions of the same type. Version 2 will now look down the inheritance tree for the first matching type. To give an example. Message = "Base Exception response"
As the above example will hopefully illustrate, as there is no configured response to ExceptionA GlobalExceptionHandler.NET goes to the next type in the inheritance tree to see if a formatter is specified for that type. GlobalExceptionHandler.NET verion 2 now supports content negotiation via the optional GlobalExceptionHandler.ContentNegotiation.Mvc package. Note how we had to include the AddMvcCore service, this is because ASP.NET Core MVC is required in order to take care of content negotiation which is a real shame as it would have been great to enable it without a dependency being required on MVC. Hopefully this has given you a good idea of what you'll find in version 2 of the GlobalExceptionHandler.NET library. Moving forward there are a few further improvements I'd like to make around organising configuration on a domain by domain basis. And as always, the code is up on GitHub so feel free to take a look. Recently I gave a talk titled 'Going serverless with AWS Lambda' where I briefly went through what the serverless is and the architectural advantages it gives you along with the trades offs to consider. Half way through the talk I then went on to demonstrate the Serverless framework and was surprised by the number of people that are currently experimenting with AWS Lambda or Azure Functions that have never heard of it, so much so that I thought I'd write a post demonstrating its value. What is the Serverless framework and what problem does it aim to solve? Serverless, which I'll refer to as the Serverless framework to avoid confusion, is a cloud provider agnostic toolkit designed to aid operations around building, managing and deploying serverless components, whether full-blown serverless architectures or disparate functions (or FaaS). To give a more concrete example, Serverless framework aims to provide developers with an interface that abstracts away the vendor's cloud specific APIs and configuration whilst simultaneously providing you with additional tooling to be able to test and deploy functions with ease, perfect for rapid feedback or being able to integrate into your CI/CD pipelines. Opening Handler.cs reveals it's the function that will be invoked in response to an event such as notifications, S3 updates and so forth. This is where the magic happens. The serverless.yml file is your schema which defines the configuration of your Lambda(s) (or Azure functions) and how they interact with your wider architecture. Once configured Serverless framework generates a Cloud Formation template off of the back of this which AWS uses to provision the appropriate infrastructure. Open global.json and you'll notice it's pinned to version 1.0.4 of the .NET Core framework, this is because as of the time of writing this .NET Core 2.0 isn't supported, though Amazon have promised support is on its way. Now, let's go ahead and create our Lambda. For the purpose of this demonstration we're going to create a Lambda that's reachable via HTTP. In order to do this we're going to need to stand up an API Gateway in front of it. Normally doing this would require logging into the AWS Console and manually configuring an API Gateway, so it's a perfect example to demonstrate how Serverless framework can take care of all of a lot of heavy lifting. Now we're set. Let's move on to deploying our Lambda. If you're reading this then I assume you already have an account with AWS, if not you're going to need to head over to their registration page and sign up. Let's verify our setup by deploying our Lambda, this will give us an opportunity to see just how rapid the feedback cycle can be when using Serverless framework. At this point if we weren't using the Serverless framework we'd have to manually package our Lambda up into a .zip file in a certain structure then manually log into AWS to upload our zip and create an infrastructure (in this instance API Gateway in front of our Lambda). But as we're using the Serverless framework it'll take care of all of the heavy lifting. Now if we were to log into our AWS account and navigate to the the Cloud Formation page in the region us-east-1 (see the console output) we'd see that Serverless framework has taken care of all of the heavy lifting in spinning our stack up. Let's navigate to the endpoint address returned in the console output which is where our Lambda can be reached. If all went as expected we should be greeted with a successful response, awesome! The difference being the former is far faster as it will only deploy the source code where as the later will tear down your Cloud Formation stack and stand it back up again reflecting the changes made in your serverless.yml configuration. At this point we can invoke our Lambda, where -l is whether we want to include log output. If our commands were written in Python or Node then you could optionally use the invoke local command, however this isn't available for .NET Core. At this point all we'd need to do is create a new Handler class (for the sake of this demonstration I called it Handler2.cs) and make sure we set the handler property in our serverless.yml configuration appropriately, we'd also need to ensure we set our new Handler2 function name to World as to match the handler address in our serverless configuration. Once deployed we're able to navigate to our second function as we do our first. Hopefully this post has given you an idea as to how the Serverless framework can help you develop and manage your functions, whether using Azure, AWS, Google or any of the other providers supported. If you're interested in learning more about the Serverless framework then I'd highly recommend checking out their documentation (which is plentiful and very well documented). In the past few years the command line has made a resurgence in the Windows world. With the .NET Core CLI now a first class citizen and the Linux sub-system for Windows making it easy to run Linux based tools on a Windows machine, it's clear that Microsoft are keen to boost the profile of the CLI amongst developers. Yet Windows has always come up short on delivering a powerful grep experience for searching via a command line, this is where a tool like ripgrep can help you. As someone that's a heavy user of grep in my day-to-day work flow the first thing that blew me away with ripgrep was its blazing fast speed. Having read its benchmarks that it so proudly displays on its GitHub page, at first I was septical - but ripgrep flies on large recursive searches like no other grepping tool I've used. Written in Rust, ripgrep is a tool that combines the usability of The Silver Searcher (a super fast ack clone) with the raw performance of GNU. In addition, ripgrep also has first class support for Windows, Mac and Linux (available on their GitHub page), so for anyone who regularly works across multiple platforms and is looking to normalise their tool chain then it's well worth a look. Ripgrep won't search files already ignored by your .gitignore file (this can easily be overridden when needed). Let's take a look at how we can install ripgrep. See the ripgrep GitHub page for more installation options. Next, let's take a look at some of the use cases for ripgrep in our day-to-day scenarios. Search the contents of .html and .css files only for the word foobar using the Type flag (t). ripgrep has a whole host of other searching options so I'd highly recommend checking out their GitHub page where they reference more examples. Hopefully this post has given you a taste of how awesome ripgrep is and encouraged you to at least install it and give it a spin. If you're someone that spends a lot of time on the command line for day to day navigation then having a powerful grepping tool at your disposal and getting into the habit of using it whenever you need to locate a file really does help your work flow. Now, go forth an grep with insane speed! Having recently attended a talk on GraphQL and read about GitHib's glowing post surrounding choice to use GraphQL over REST for their API, I was interested in having a play to see what all of the fuss was about. For those that aren't sure what GraphQL is or where it fits in the stack let me give a brief overview. Now as a mobile app developer calling this service you're aware of the constraints on bandwidth users face when connected to a mobile network, so returning the whole JSON blob when you're only interested in their FirstName and Surname properties is wasteful, this is called over-fetching data, GraphQL solves this by letting you as a consumer dictate your data needs, as opposed to having it forced upon you by the service. This problem is a fundamental requirement that REST doesn't solve (in fairness to REST, it never set out to solve this problem, however as the internet has changed it's a problem that does exist). This is where GraphQL comes in. The GraphQL query language includes a whole host of other functionality including static type checking, query functions and the like so I would recommend checking it out when you can (or stay tuned for a later post I'm in the process of writing where I demonstrate how to set it up in .NET Core). In fact, I'd suggest you taking a moment to go try a live exampe of GraphiQL here and see how GraphQL's static type system and help you discover data that's available to you via the documentation and intellisense. GitHub also allow you to query your GitHub activity via their example GraphiQL endpoint too. Now you no longer need to worry about taking a dependency on Node or NPM in your ASP.NET Core solution and can instead add GraphiQL support via a simple middleware calls using GraphiQL.NET (before continuing I feel it's worth mentioning all of the code is up on GitHub. You can install GraphiQL.NET by copying and pasting the following command into your Package Manager Console within Visual Studio (Tools > NuGet Package Manager > Package Manager Console). From there all you need to do is call the UseGraphiQl(); extension method within the Configure method within Startup.cs, ensuring you do it before your AddMvc(); registration. Now when you navigate to /graphql you should be greeted with the same familiar GraphiQL screen but without the hassle of having to add node or any NPM packages to your project as a dependency - nice! The library is still version 1 so if you run into any issues then please do feel free to report them!